It’s been a long time not to have this Hong Kong Style sausage roll, Hong Kong style. 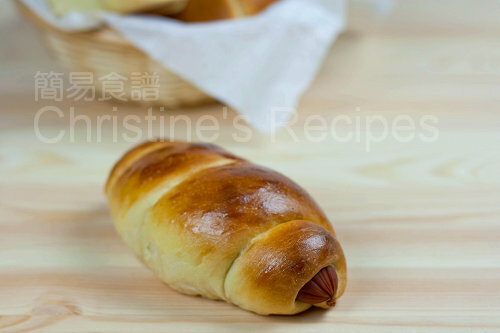 A reader left a comment on my Chinese food blog a few days ago, letting me know she liked the tangzhong recipe very much and was succeeded in making some soft and fluffy Hong Kong style sausage rolls. Waahoo…the comment really intrigued me to make some to satisfy my craving. Transfer to a clean floured surface. Deflate and divide the dough into four to six equal portions. Knead into ball shapes. Cover with cling wrap, let rest for 15 minutes (see picture 2). Knead each part into a long tube, about 41cm in length (it depends on how long your sausage). Roll to enclose the sausage, with seals facing down (see picture 3). 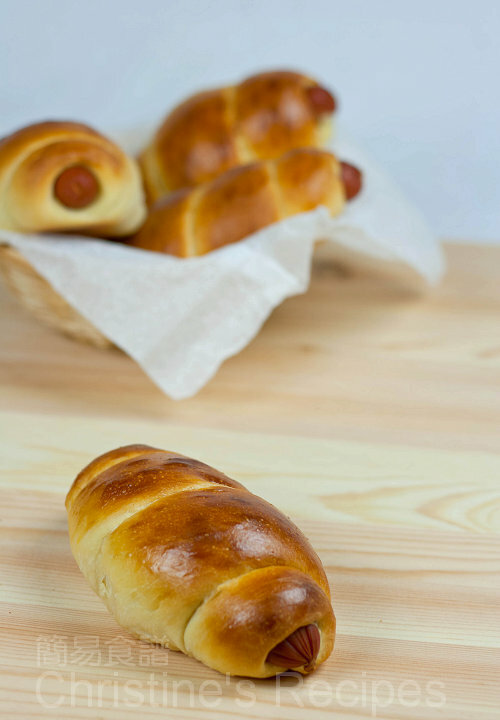 Place rolls on a tray lined with baking paper, covered with cling wrap or a wet towel. Leave it for the 2nd round of proofing, about 45 to 60 minutes, until double in size. Brush whisked egg on surface of rolls. Bake in a pre-heated 180C (356F) oven for 35 minutes, or until golden brown. Transfer onto a wire rack and let cool completely. This bread can be made with or without a bread maker. Testing your dough before proofing is quite important to make sure you’ll enjoy soft and fluffy bread after baking. The time of proofing has to be long enough, yet not to over-do, in order to get the best result. Looks better than the ones in the bakery which almost never taste fresh once you've bought them! This is AMAZING! FANTASTIC! I just adore sausage rolls - especially when you have dough as beautiful as that. I will definitely make this soon! They are perfect, well done! Yummy, looks exactly from local HK bakery. I have to make time to try this method! These look wonderful...so soft and golden! These look so good, totally delicious and very pretty! These are so nice..great recipe!! These look perfect! Look exactly like from bakery store, you're so talented. oh you got me craving sausage rolls! OMG! I always buy this at breadtop. Now I know how to make it! These are my daughters' favourite at dim sum! looks delicious! I really need to try the tangzhong recipe. I have had it lying around for a year and forgot about it! I really have to making some of those tang zhong bread! Looks amazing. I love these frankfurt buns! So much that I made teh tangzhong recipe last night....going to finish off tonight. Can't wait! I've seen these around in some of the bakeries here, but even better I can now make them for myself! Thanks for sharing your wealth of information. The bread is so soft and fluffy. Using the breadmaker to knead and proof this dough using the tangzhong method, will the dough be easy to handle, is it sticky? I love sausage rolls !! Hi Christine, how're you? A couple of questions. I'd like to incorporate tangzhong into my other bread & bun recipes, but how much do I put in? Also does 5-6 gm of yeast equals 2 tsp? Thank you. You may use any bread recipes incorporating tangzhong method into it. The tangzhong is 20% of total weight of all the wet and dry ingredients of any bread recipe. Calculate the tangzhong: 1 part of flour with 5 parts of water on that 20% part. Then you have to subtract(take away) the amount of the flour and water that used in tangzhong from the main ingredients. Thanks Christine for the explanation on the usage of tangzhong in other recipes. I'm now ready to knead and roll. But first I must make your Walnut Butter Pound Cake. Looks yummy. Have a good weekend. 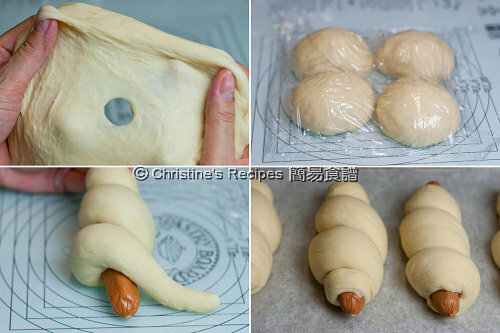 Hi Christine, I just made the sausage rolls and they are delicious! Thanks for the recipe! Just another note to say thanks for the great recipes. I made those hot dogs this weekend. They turned out great! I was wondering what make and model is your bread maker? My bread maker is Sunbeam, the basic model-Bakehouse Compact. OK, I just made the tangzhong part of this recipe, and I never saw those lines you spoke of. It just went very quickly to a thick pudding thickness. Could you help me to figure out what I've done wrong? Should I assume it won't work now? The tangzhong is a thick flour paste actually. When cooking, swirl a balloon beater, you should've easily seen those lines when the tangzhong is done. It doesn't need to be too thick anyway. Btw, if you get a thick paste, I guess it's ok. I used Continental Frankfurt. That's quite long, but you can cut it into two if you like. How many days does your bread stay soft at room temperature? Is Tangshong same as bread improver? Thanks! I tried your recipe days ago. The bread flavour is very good, but it wasn't fluffy enough. I used my bread machine too, but how long is your machine kneading? In response to your explanation to Sarah about incorporating TangZhong into normal bread recipe, can I ask, when you mention 'all the wet and dry ingredients of any bread recipe', do you also include butter and egg? And when you say subtract, do you subtract from the 120g TangZhong amount or do you subtract from the original amount? How would you know how much bread flour and water is used to obtain 120g TangZhong? Sounds complicated but thank you!!!! For making the tangzhong, I often use 50 grams of bread flour and 250ml of water and then I can get about 245 grams tangzhong (How can I know? I simply knew it by weighing the tangzhong with my electric kitchen scale.) Every time I just use half of it, or measure out 120grams. When you want to convert a regular bread recipe into tangzhong recipe , you have to take out the amount of flour and water from the original recipe because you have already got them in your tangzhong. Sounds easier? this all thanks to your recipes!!!!! I'm so happy for you. I guess you hadn't tapped into your cooking talents before. Now you can prove your mother-in-law wrong. Keep it going, Krystina. The crucial key to making fluffy bread is to knead your dough to a perfect stage with enough gluten inside. The time prescribed in the recipe is only a reference. Your aim is to knead your dough until it can be stretched to a thin “membrane” as the picture shown on this post. If you knead your dough well enough, let it proof until double in size, it'd be very soft and fluffy. Normally, I have to knead dough for 30 minutes in my breadmaker. hi christine, when kneading the dough in the breadmaker, when do you add in the butter during the kneading cycle? 5 minutes or later? thanks a bunch! I normally add the butter in when all ingredients come together and just begin to form a ball shape. Thank you for sharing this lovely recipe. My boyfriend was very surprised and very happy about them. The unsed tangzhong should be kept in fridge. It can't be kept very long at room temperature, a couple of hours would be fine, as long as the weather is not too warm. Tangzhong is not the same as bread improver. If you use bread maker, that's pretty easy, just put all the dry and wet ingredients in and let it knead for you. I use my bread maker to KNEAD about 25 to 30 minutes, until the dough becomes elastic. Instead of using a bread maker, can you use the dough hook on a kitchenaid to knead? Yes, you can try to see how it goes. The tangzhong method and recipe is fantastic! This method is similiar to using a sponge starter for French Bread. The trick to kneading the sticky wet dough with a dough hook is to mix the ingredients until just combined, cover with cling wrap for ~10 min, and then knead again. This allows time for the flour to absorb the water. Then knead again until dough is smooth. Just want to thank you for great recipe. I had made this last week and the bread result was incredibly soft! Another great success! Aw, the tangzhong method is spread like a fire. Seems that every baker loves it once they give it a go. Glad that you had a big success too. Congrats! can you tell me how to get a soft n shiny crust?. If the temperature of your oven is too high or bake too long, the crust will be hard and dry. Make syrup - Mix 1 teaspoon of sugar in a tablespoon of water, dissolve completely. When your sausage rolls are almost done, brush syrup on top, bake for 5 minutes. Then you'd get shiny crust. Tested your recipe it was amazing I live in hawaii and we can get this at chinatown or anywhere on the island of oahu but no more i can bake these myself your recipe is just awesome my family just loves it mahalo your recipe rocks! Thank you so much Christine! I have always wanted to know how to bake fluffy bread and so glad find your site. Have you tried to bake taro filled taro bread? I can't seem to find that recipe anywhere. Again, THANKS! I'm a new fan of your sites, both Chinese and English. Thank you for sharing all of your recipes. My family is very happy with me trying out many of your recipes. I have a question, could this bread recipe be use for Char Sui Boa (叉燒餐包)? I've tried your recipe for 叉燒餐包 (it doesn't seem like your usual recipe since it was not measured in grams) and it was a bit dry and hard. I was just wondering if this recipe with the tangzhong method could be use the same way with 叉燒餐包? As for this recipe, you can wrap any fillings inside, char siu is good. Don't bake the breads too long or at too high temperature, otherwise they turn dry. Every oven is very different. I'm making the dough this morning and use my Kitchen Aid to do the kneading. It kneaded a good 45 minutes and it was still sticky. The membrane has formed but the dough cannot be handled with hands. I let it knead for another 10 minutes and I was afraid it may be over kneaded. I live in US in the east coast, could the altitude here make a difference? I added more flours and it is a little better. It is proofing right now so I'll let you know how this goes? :)I'm making the rolls for my five years old nehpew's birthday party. I have tested the tangzhong method with my stand mixer too. It took longer time to knead the dough than my breadmaker. Suppose that you have measured all the ingredients correctly, it's still workable, although the tangzhong is much more stickier than other kind of dough. You might sprinkle a little bit of flour on the surface so that you can shape it. But make sure not too much, as the texture of the bread would turn dry. sorry think I posted onto wrong recipe. Any idea on how long roughly should I be hand kneading for as my dough came out from sticky and unmanagable but tasted fine. wow looks very very good, better than the bakeries'. i wanted to know if i could substitute bread flour with plain all purpose flour . Yes, you could use plain flour/all purpose flour instead. But the texture of the end result won't be as soft as those made by bread flour. Yeah, the tangzhong dough is quite wet and sticky. The dough has to be kneaded enough, generating enough gluten inside, not sticky on the surface at least. If using bread machine, it's much more easier. What can we use regular sugar? I often use caster sugar for baking. For this recipe, you might use regular sugar if you don't have caster sugar. Made these rolls today...Yummmm...thank you so much for sharing the recipe! I lost counts of how many times I used this recipe, but without tasting any yeast smell as a result. If any dough is over-proofed, the yeast will produce strong smell.